• Sophia means Wisdom in Greek Language. When we translate the full name of Hagia Sophia to English it is Shrine of The Holy of God. 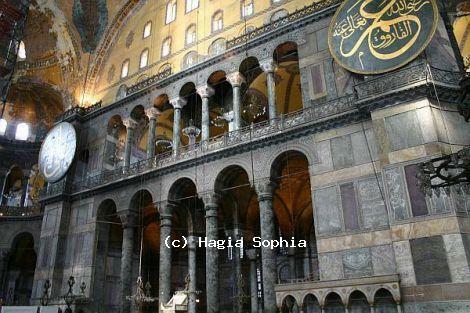 • Hagia Sophia was dedicated to Logos who was the second person in the Holy Trinity, in December 25th. • There were two more Churches accepted as Church of Holy Wisdom, but only Hagia Sophia was not destroyed. • The Alter, the bells, sacrificial vessels and iconostasis were all removed when the church was converted into a mosque. • When Hagia Sophia was a church 50 foot silver iconostasis was decorating inside, now it is on display in the museum. • Only Patheon in Rome has slightly bigger dome than the dome of Hagia Sophia in the world. • Hagia Sophia was converted in to a museum in 1935 by the first President of Turkey, Mustafa Kemal Ataturk. • Eastern Orthodox Church focused on Hagia Sophia for 1000 years as an important place. • The Blue Mosque and Sultan Ahmed Mosque in Istanbul were designed with an inspiration of Hagia Sophia. • Hagia Sophia as a museum has both Christian and Islamic influences and features today. • Hagia Sophia has 40 windows in the area where worshipers sit and it’s known as famous reflecting mystical light. • When the dome of Hagia Sophia was placed, walls began to lean outward because of the weight. Then walls to support to dome were built. • A mathematician, a Scientist and a physicist designed the Hagia Sophia. • Many Christian mosaics and frescoes were plastered over when Hagia Sophia converted in to a mosque by Sultan Mehmed II. • Hagia Sophia is visible from far miles distances because of its grandness. • The stone cannonballs, which were used by Mehmet the Conqueror, are on display near the entrance of Hagia Sophia. • Hagia Sophia is one of the most important buildings in Istanbul and needs some restorations and repairs. • Hagia Sophia was constructed over fault line and earthquake can tear the structure down. It must be strengthened with some works. • Some repairs in Hagia Sophia are going on today but definitely needs more financing.